This is my own recipe, it is not too sweet, and makes a nice spicy coleslaw. In a bowl large enough to hold everything, whisk together the first seven ingredients: Miracle Whip, sugar, horseradish, dry mustard, pepper, garlic and salt. Add the cabbage, onion, and carrot. Mix well. Cover and keep this in the refrigerator over night, allowing the flavors to blend. Mix again, just before serving. 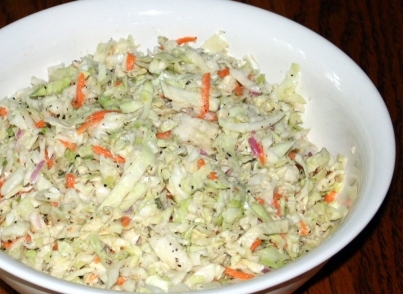 Coleslaw goes great at cookouts, or with Barbequed Pork Spareribs.